He was not given a formal education; he was home-schooled, though he was a scholar in mathematics, philosophy, world history, and science. He was also well-versed in Urdu, Hindi, Persian, Arabic, Bengali, and English. A journalist that he was, Maulana Azad was truly a revolutionary and communicated through the many journals he circulated in Urdu. He served as the Education Minister in India between 1947 and 1958, during which he brought in many new approaches and institutes to set the foundation that the Indian Education system has today. His ideas for the expanse of education in India were marvelous as he understood the co-relation between education and nation’s social & economic development. In order to eradicate India of its illiteracy and ignorance, he strongly advocated elementary education be made free & compulsory for all till age 14, emphasizing that education is a right. He established the important educational organizations like the AICTE and the UGC. The higher education institutes like IIT’s, the IISc, and School of Planning and Architecture – all came into being during his tenure with his initiation. 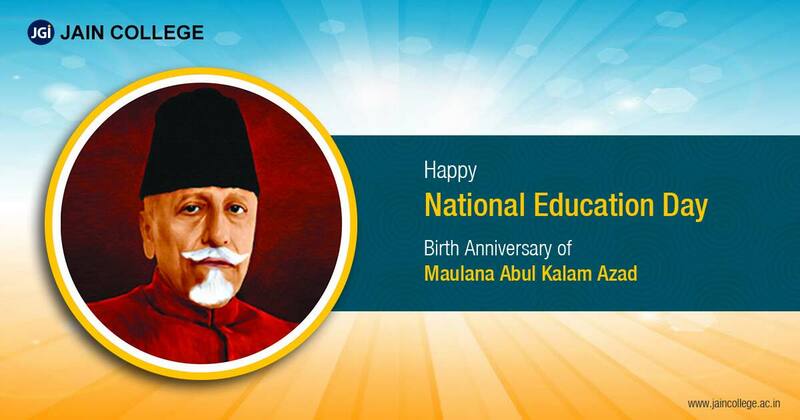 Maulana Azad also introduced the concept of adult literacy & education and advocated girls’ education, secondary education, and vocational & technical training. He further went on to establish academic bodies to promote culture and literature through Lalit Kala Academy, Indian Council for Cultural Relations, Sahitya Academy, and Sangeet Natak Academy. Maulana Abul Kalam Azad was posthumously awarded the Bharat Ratna Award (India’s highest civilian award), in 1992. We remember and commemorate National Education Day on his birthday in order to strengthen our educational system and to improve the quality of education in all spheres. It is quite a journey we have had for all these years in the educational sector. Much has been achieved and much more awaits us. It is because of such great and dedicated personalities, that we are eating the fruit of their labor. Jain College, Bangalore has been doing its part in enhancing young achievers and achieve further to bring about the change and improvement we hope for as a country. The College is one of the premier institutions giving a base for higher education equipping students through its academics, experienced faculty, heightened attention to extra-curricular & sports and in bringing a wholesome educational experience to all its students. Jain College has been mentored and provided by the JGI Group headquartered at Bangalore, India.